These hotels in Cologne are cheap – but that doesn’t mean you have to sacrifice location, style, or service when staying there. From art hotels and design motels, to cozy family run hotels, here are the best hotels in Cologne that offer rooms under 100 Euros. Hotel Domstern is perfectly located in the heart of Cologne: It is in walking distance to the Cologne Cathedral, the central train station and everything else there is to see in the city. The family-run hotel is set in a historic building from 1890 and offers 16 newly renovated no-frills rooms; the complimentary breakfast buffet includes fresh baked bread and homemade jams. The 2-star boutique motel chain “Motel One” combines modern design and low budget prices; the small but functional rooms are equipped with air conditioning, flat screen TV and WI-FI and they captivate through their modern style. Combining cream, chocolate and turquoise colors together with materials like brick, wood and leather creates a hip and cozy atmosphere for the rooms and lobby. Motel One Cologne is located in Koeln-Junkersdorf, 10 km outside the city center. The Statthaus offers furnished apartments/vacation rentals just a stone's throw away from the Cologne Cathedral. Built in 1860 as a monastery, the Statthaus is a unique place to stay and features spacious, tastefully designed apartments in various sizes (including a penthouse with views of the cathedral). The prices are unbeatable and the longer you stay, the lower the rates will be. The Art’otel Cologne, located right at the river Rhine, is inspired by the Korean artist SEO; her original artwork fills the hotel and guests can even take guided art tours. The 218 chic rooms are equipped with free Wi-Fi, a work desk, telephone, flat-screen TV, laptop safe, coffee and tea maker, mini bar and of course SEO’s paintings. There is also a sauna, rooftop terrace, lounge, library and a Pan-Asian restaurant with panoramic views of the river. One of the most affordable hotels in Cologne is the family-run “Im Kupferkessel”; the rooms are clean, bright and simple and if you want to save some extra money, you can also opt for a room with a shared bathroom. 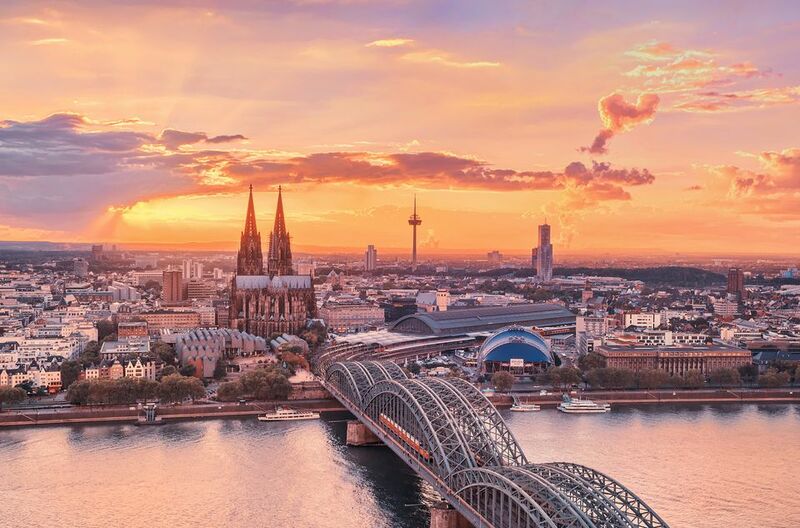 Guests rave about the generous breakfast buffet and it’s a convenient 15-minutes walk from the Cologne’s central train station and the Cologne Cathedral to the hotel.